Being trained in Traditional Chinese Medicine principles, our ND's are very familiar with the recent jade-rolling trend. For those of you who have not heard of Jade Rollers, they are a beauty secret you're sure to love. Jade rollers, named for their beautiful jade stone, increase lymphatic flow and drainage + enhance circulation on the face. You simply hold them in your hand and gently massage your face. They have long been used during acupuncture sessions to enhance the effects of cosmetic acupuncture. The Jade stone is rolled along the meridians to enhance the movement of Qi and reduce the risk of bruising from the needles. A fun tidbit, we keep ours in the fridge for an added cooling sensation. Gently massage face following the flow of the arrows. You can do this morning and evening for best results, and before you apply your face cream. And let's not forget that Jade is a stone that has long been touted for it's magical tendencies to boost confidence and bring out the best in people. This beauty hack isn't just skin deep but instead follows one of our favourite principles to live by: a beautiful inside creates a beautiful outside. Don't forget to love yourself when you're taking the time to massage these beauties on your delicate skin! 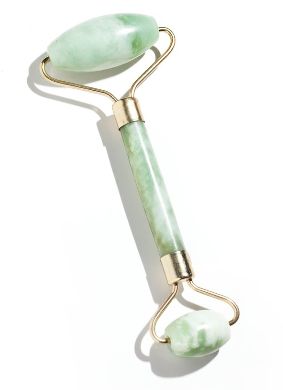 Looking to get your hands on a Jade Roller? Stop into EAST ND's health stop Monday-Friday between 9am and 5pm. If you miss one of the ND's our office manager Shelley can help you!